Google boss Eric Schmidt and Facebook founder Mark Zuckerberg have warned governments not to over-regulate traffic on the internet. - Give Up Internet! Google boss Eric Schmidt and Facebook founder Mark Zuckerberg have warned governments not to over-regulate traffic on the internet. 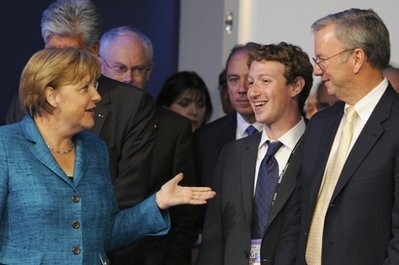 Zuckerberg said that governments cannot cherry pick which aspects of the web to control and which not to. The two heavyweights are leading a group of high-profile online pioneers to the G8 summit in France. The group will deliver recommendations that have been created at the first e-G8 gathering in Paris this week. The e-G8 has the blessing of President Sarkozy, but world leaders are not bound by its findings. Zuckerberg and Schmidt’s position reflect growing concerns among internet industry professionals that government’s are getting too involved in how the web operates. Next postMark Zuckerberg: Kids under 13 should be welcome to have us leak their personal information too.